With Green Lantern: Sinestro, Geoff Johns brings Green Lantern into the DC New 52 with a story that doesn't rely too heavily on previous continuity and serves as a good introduction to the Green Lantern universe. Dedicated readers, however, will find themselves in almost inexplicably familiar territory, with a status quo that's been stretched well beyond believability. Now that the twin hurdles of the Blackest Night crossover and the DC New 52 relaunch have passed, I'd like to see Johns do something new with Green Lantern instead of variations on the same old thing. The best thing about Green Lantern: Sinestro is, of course, Sinestro. Geoff Johns has, especially since Green Lantern: Secret Origin and Rage of the Red Lanterns, written a fantastic "buddy comedy" in his scenes with Sinestro and Green Lantern Hal Jordan. Sinestro is the stubborn, by-the-book straight man while Hal is the laid-back upstart that always grabs the glory in the end. It's the formula of Men in Black's Agents K and J, or Psych's Detective Lassiter and Shawn Spencer, except more like the Smallville portrayal of Lex Luthor and Clark Kent -- Hal and Sinestro are mortal enemies, but the reader senses their ire comes strongest from the two former friends' hurt over no longer seeing eye to eye. With Sinestro, Johns is able to reduce Hal back to a pseudo-Secret Origin status -- it's not as though Hal Jordan is a neophyte nor has lost any of his previous adventures, but he's once again Sinestro's student, taking Sinestro's orders. Even Hal's DC 52 costume can be explained away as a construct of the ring given to him by new Green Lantern Sinestro. Much as Hal distrusts Sinestro, it's a joy for the reader to watch Hal slowly have to come around to advocating Sinestro's leadership in order to rally fellow prisoners to help free them all from an alien prison. Despite Hal's new role as Sinestro's assistant, however, and the general fun of reading these characters in scenes together, not much is different here than Johns's Green Lantern stories that we've read before. Hal and Sinestro snipe at one another? Check. Sinestro fights a contingent of his Corps that have turned against him, as in Blackest Night? Also check. Even Johns's manner of creating suspense begins to repeat itself. This iteration of the Green Lantern title has long since been about secrets and prophecies -- the prophecy of the Sinestro Corps, the prophecy of the War of the Light, and the prophecy of Blackest Night, each of these teased through hints and vague conversations for a matter of months before they're revealed in one crossover event or another. When it seemed the Green Lantern's Guardians couldn't possibly have more secrets to keep, now these pages contain rumors of a "Third Army" and a "First Lantern" guarded by the "Chamber of Shadows." Johns uses these vagaries to good effect in fleshing out Sinestro; as the title implies, Hal is here but this is largely Sinestro's book. 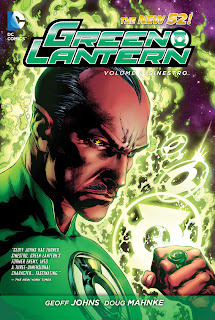 Among past events given quick references are Sinestro's battles with the alien hero Starstorm and also Starstorm's father; how Sinestro has broken the supposedly-unbreakable Green Lantern rings not once, but twice; and Sinestro's relationship with Korugian police officer Arsona (before the reader even fully learns about Sinestro's relationship with Arin Sur, sister of Hal's predecessor Abin Sur). All of this achieves its goal of world-building -- the audience feels Sinestro as a fleshed-out character. Only, when the Sinestro volume contains references to untold tales on every page, the narrative device becomes excessive -- suspense is one thing, but no one wants to read a book that continually teases the audience with how much more it knows than they do. Don't get me wrong -- I'm along for the ride. DC has recently announced a Green Lantern Annual written by Johns and drawn by Johns's Green Lantern: Rebirth collaborator Ethan Van Sciver, and this will undoubtedly be full of cosmic twists and turns of the kind the Green Lantern series has kept readers coming back for. Only, it would be more impressive if Johns began to slip the reins of what's been done with Green Lantern to this point and try to innovate -- what would the Green Lantern Corps look like if not lead by the Guardians at all, for instance? In assessing the DC New 52, it ought not be overlooked that Hal Jordan kills a member of the Sinestro Corps in this volume. Aquaman seemingly killed a Parademon in Justice League: Origin, but the King of Atlantis's morals have never been so stringent as the human Green Lantern's (and one can debate whether a Parademon "lives" anyway). Granted the Lanterns have permission from the Guardians to kill members of the Sinestro Corps, but it's been generally understood that Hal Jordan, like Superman and Batman, did not kill. That this scene passes without fanfare in the book is troubling but not necessarily surprising; if indeed the reticence to kill in the old DC Universe has passed for the New 52, this brings the DC Universe in line with most popular movies and video games even if it's hardly a positive trend overall. The first DC New 52 Animal Man volume was a satisfying new take on the character, a meal unto itself and a dynamic set up for the next volume. Batman: The Court of Owls too had a lot of content while setting up the "Night of the Owls" crossover well. Green Lantern: Sinestro feels a little thinner, heavy on character but not necessarily going anywhere new; hopefully the second volume delivers better. Up next, we'll be delving back into the pre-Flashpoint DC Universe for a week or so, finishing out the runs of Teen Titans and related titles. See you then! Am I the only one hoping that the Green Lantern annual will explain some of the continuity quirks between the old and new DCUs? Or at least, will it acknowledge that there is a past and present and so we don't need to worry about some of these questions? The situation isn't as bad as "Spider-Man went through the entire Clone Saga, just without MJ", but some of the pre-Rebirth stuff in relation to the rest of the GL storyline would have to be really compressed to work in the new universe. Marketing and such had lead me to believe that there might be some acknowledgement of Flashpoint in War of the Green Lanterns, but there wasn't -- there's the bit with the Guardians in Flashpoint: Abin Sur, but of course that's out of "our" continuity. Still, I've been wondering the same, whether the Green Lantern title specifically might touch on the changes in the DC Universe (though in terms of moving the company forward, looking back and acknowledging the old continuity might not be the best strategy). I think this review has illustrated that Geoff Johns should have stopped writing Green Lantern with the reboot. Lots of creators have had great runs on titles, but eventually stayed too long and things got stale. The reboot would have been a great time for Johns to have moved on and a new creator, perhaps Peter Tomasi, take over. Examples of this would be Mark Waid at the end of his Flash run, and it is happening with Ed Brubaker on Captain America. The stories are still good, but they are less then what came before. As CE pointed out many of the story ideas are just rehashes of old ones with a new twist. Thoughts? *Random question alert* Can anybody tell me if Adventures of Superman #648 was collected anywhere? It was Greg Rucka's last issue of his first run on the title and was an Infinite Crisis tie-in. Tomasi on Green Lantern is an interesting suggestion, though I rather like how long Johns has stuck it out on Green Lantern. Seems to me in the "olden days" writers used to remain on books forever -- Mark Waid on Flash is a good example; Dan Jurgens on Superman is another -- and it built a sense of familiarity and voice with the character. Whether that must ultimately lend itself to an end that peters out, I'm not sure. As for Adventures #648, I know that one off the top of my head. No, sorry, never collected. This GL book seems like a pretty straightforward ans seamless transition from the previous continuity into this New 52. Recapping the mythos and rules of the GL book, with an all-new twist (good!Sinestro and student!Hal) yet the same formula and usual plots. I'm pretty sure Johns has already had the longest run on Green Lantern in history. I think it's about time for him to wrap up his storylines and pass the torch. But honestly, I'd settle for him just wrapping up his storylines. The War of Light was cool for the first two years, but after 4 solid years of it, I'm sick of the concept already. Put the Rainbow Corps (which is a concept that I really do like, and I think people who find it childish should think about the genre they're reading) on the backburner and use some of the rest of the Green Lantern mythos. Johns has said numerous times how rich the Green Lantern mythos is, yet he's used very little of it in favor of his own innovations. Which is fine. But I think the time has come for him or someone else to innovate another angle. Also, I am not going to forgive the complete excision and ignoring of Cowgirl lightly, and I think it's a dreadful waste for Johns to have spent a whole arc detailing how Hal got back into the Air Force, only to have him lose his job after doing almost nothing with it. Geoff Johns is the 1st writer in decades to truly grasp the scope & depth of the GL mythos. Anyone reading Johns GL should be able to grasp in a second that there is so much more that he is just scratching the surface of so far. The worst thing DC could do right now is have Johns the driving force behind GL leave. GL is the 2nd best selling franchise at DC right now & the most consistent franchise. If Johns left I don't even want to think what would happen w/ half assed concepts like New Guardians and the like becoming the norm on GL. Sinestro training Hal was never new. For the most recent non-Johns iteration, see Emerald Dawn I & II by Keith Giffen,Jim Owsley and Gerard Jones, which to me still presents a more intriguing origin than Secret Origin. Johns has incorporated Sinestro seamlessly within the new mythos (starting with his run on GL in Rebirth). When you read it from start to current, in Emerald Dawn how the student teacher relationship changes, in Emerald Twilight, when Hal snaps Sinestro's neck, in Sinestro Corps War and now here back to allies, it all seems so epic without being patchy or a downright eyesore.